HomeBlogArticlesWhen Does a Child Need a Hearing Test? 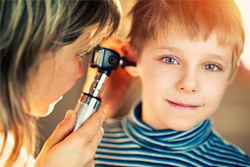 When Does a Child Need a Hearing Test? For the most part, people will generally associate hearing loss with the elderly. There is certainly sufficient evidence to support such a position, based on the absolute number of seniors who require the use of hearing aids in their daily lives. From an overall developmental perspective, when hearing impairment is suspected in a child, a formal diagnosis and treatment are paramount in both importance and urgency. In such cases, parents are encouraged to seek a professional assessment immediately; this can be accomplished by contacting a hearing specialist at Bravo Hearing Centre in Etobicoke. Audiometric testing, or a hearing test, is a painless and non-invasive evaluation of one’s ability to hear different sounds, pitches, or frequencies. This methodology is particularly important in circumstances when children are being tested in order to prevent them from becoming unnerved/fearful and to obtain a valid and actionable assessment as well. If you believe that your child may be experiencing some degree of hearing loss, call the hearing specialists at Bravo Hearing Centre today at 416-207-9711 to book a hearing test as quickly as time permits.